November 13 is World Kindness Day. If only each of us would do one thing today to make the world kinder. 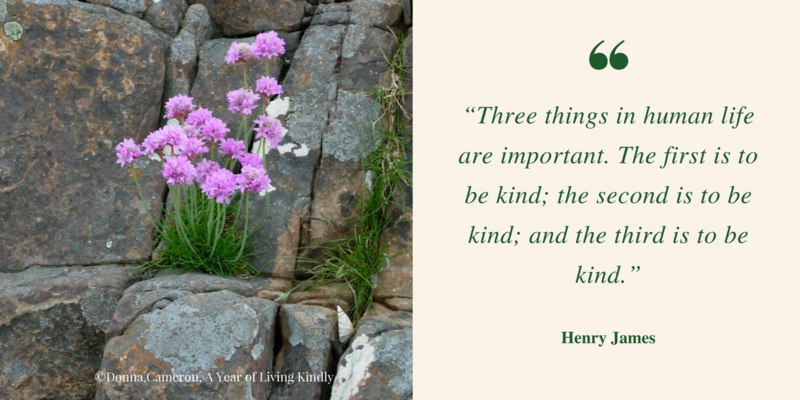 This entry was posted in Kindness and tagged Extending Kindness, Kindness, World Kindness Day by Donna Cameron. Bookmark the permalink. Ah, the world is a much better place for you being in it, Donna! Jan, thank you so much for that lovely comment—you are so very kind yourself! So good to hear from you. I hope all is well in your world. If only every day was World Kindness Day. Hey! Let’s act as if it is! And ditto what Jan said, Donna, it’s true. You’ve got the right idea, Kris . . . let’s make every day Kindness Day. And thank you for the kind words. I’m hoping Bill doesn’t weigh in and set the record straight…. Thanks, my friend! I vote it be World Kindness Century.